The supremely consistent kick pedal of legendary jazz and fusion drummer, Jojo Mayer. 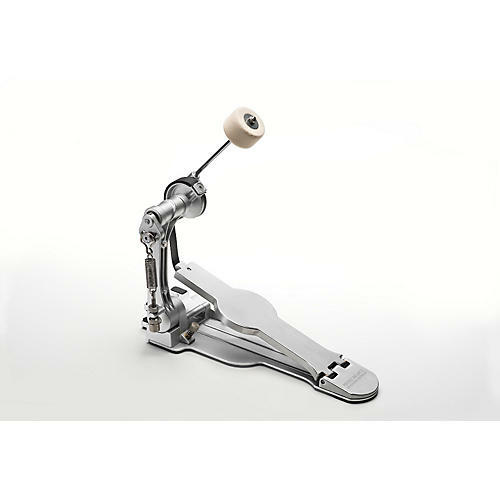 With a design conceived over six years of tireless personal experimentation, the Jojo Mayer Perfect Balance Pedal by Sonor is a carefully calibrated system that optimizes the linear translation of your foot movements and makes many adjustments expendable. It possesses the soul and feel of a vintage pedal reincarnated in the technology of a 21st century body. Starting at its foundation, this pedal is engineered to fuse tradition and innovation. The drive cam and beater hub are streamlined into a single unit for low mass and calibrated for perfectly balanced strokes. A round cam design creates linear acceleration that is an advantage for many hybrid techniques. The pedal offers a sensitivity that borders on intuition. An elongated and smooth footboard adds more leverage to the stroke and allows extended range of movement for heel toe and sliding techniques. Ballistic fiber strap minimizes inertia of the drive system and offers a quicker and smoother response than chain or solid drives. For those who prefer the strength and feel of chain, the pedal can easily be retrofitted with a double chain. A revolutionary quick, self-mount affixes the pedal with a single motion, while the clamp adjusts to all hoop thicknesses. Magnetic spring dock secures spring during transportation that dramatically extends the life of the spring. In additional, standard allen screws are metric items that can be obtained at every good hardware store. No need to special order replacement screws any longer. For the traveling percussionist, this pedal also easily folds into a compact size with the click of a button. Compact Tarpaulin style pedal bag makes bulky carrying cases obsolete. Includes shoulder strap. Find your perfect musical balance starting from the low end on up. Carry it out today!